Composer Sir Karl Jenkins celebrates his 75th birthday this year but he's certainly not retiring – instead, he has embarked on a series of concerts to mark the occasion. The tour brings him to Birmingham Symphony Hall on Sunday March 10 as well as taking in dates at London's Royal Albert Hall, Glasgow and Manchester. The concert will feature Jenkins conducting excerpts from a host of his best-known compositions including 'The Armed Man: A Mass for Peace', 'Palladio', 'Symphonic Adiemus' and '6000 Pipes Organ Concerto'. Performed by Manchester Concert Orchestra, the afternoon concert will also feature mezzo-soprano Kathryn Rudge and organ soloist Jonathan Scott. Born and raised in South Wales, Jenkins studied music and initially wrote and performed rock music. In 1995, he composed Palladio, inspired by the Italian Renaissance architect Andrea Palladio who was renowned for the harmony of his buildings. This was followed by a series of Adiemus pieces which saw Jenkins reach number one in the classical music charts. Jenkins is today one of the UK's best-known composers. 'The Armed Man: A Mass for Peace' was commissioned to celebrate the Millennium and was premiered in the Royal Albert Hall in 2000. It has gone on to become one of Jenkins' most famous works having been performed around 1,000 times in 20 different countries. His subsequent composition, 'The Peacemakers', which he conducted at Birmingham Symphony Hall in 2012, features quotes from numerous historical figures including Nelson Mandela, Mother Teresa, Anne Frank, Martin Luther King and Jesus Christ. 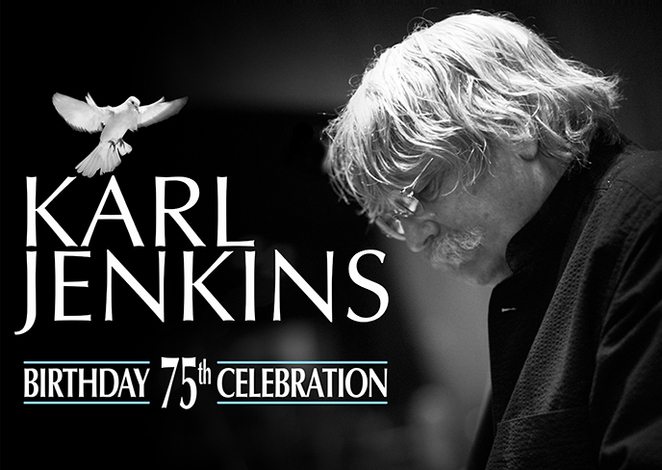 Sir Karl Jenkins: 75th Birthday Concert is at 3pm on Sunday March 10.